I use drinking water, being a SONEB (Société Nationale de l’Eau du Bénin) subscriber. When I need it, it’s easy to obtain. All I do is open the tap and whoosh! The water gushes out. It’s probably the same for you, no? But for others, this isn’t the case. Those who cannot take out a water subscription must get water themselves either by walking, with a basin on their head, or by motorcycle, with an empty can, or by buying it from a neighbour who makes money from the tap in their house or a drilled well. What about fetching water from the river? To answer this question, I’d like you to travel in a region of Benin with me. Let’s go! We first travel through the department of Ouémé, where we stop in the Plateau, specifically in the village of Atchaga, located in the district of Akouho, in the commune of Pobè, over 100 km from Cotonou. In this village there is a river called Iyuin. Women and children are the ones who usually go and get water from this river, on average about twice a day. To access the river, they must walk about two kilometers through a large forest with a rugged trail, at times barely visible, with a basin on their head. At the river, they do laundry and dishwashing. Water brought back to the house is for cooking and drinking. This is a major hassle for people, especially on the way back, with a heavy load on their head. My name is Célestine. The place we go to get water is very difficult to reach! The river is very far from us…The authorities should help supply us with water so that we are at peace. This water, once collected, is not protected from contamination of all kinds. Water, whatever its source, must be kept in a clean container with a lid because it often becomes unfit for consumption by poor hygiene during transport and storage. 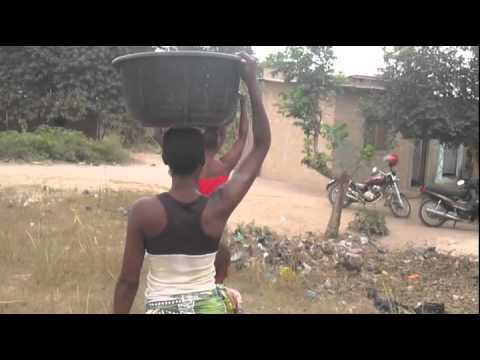 If it is unfortunately true that in some populations of Benin—especially in the countryside—have no access to drinking water, and that proper hygiene is not always followed, you must keep in mind that the environment is a common heritage and that water, a scarce and precious commodity, must be safeguarded by everyone in both quantity and quality. I have shared with you the difficulties that the inhabitants of the village of Atchaga face in their use of water from their environment. From reading this article, I think you know my opinion on the question of access to water. And you? What do you think?